Home / SURPLUS, military and civilian. 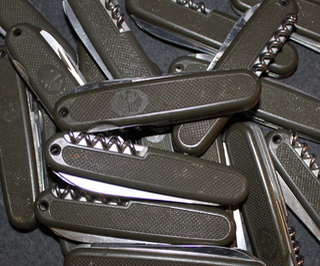 / Bundeswehr Pocket knife. Victorinox, CCM etc. Original issued german army pocket knife, various manufacturers. These knives are original BW items, all of these show some wear and some dirt is also possible, but nothing that cant be sharpened out. Other blades are corkscrew, saw, drill. Swiss Rank insignia. Star 18mm.